Sunday mornings are deliciously quiet in our house. We’re still up early but never need to be anywhere so have the luxury to lounge with the paper, wander in the garden in our PJ’s and play board games with the kids. Sunday is my cinnamon bun morning because I don’t need to schedule the two short risings into other activities. 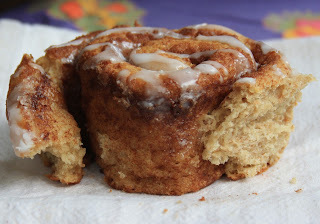 I make my cinnamon buns with substantial, flavourful flour (from Speerville Flour Mill). It makes them more nutritious and extra tasty. And I load up on the cinnamon. I'm restrained with the glaze though, since I only want to add a little more sweet. Combine flour, sugar, salt and yeast in a large bowl. Melt the butter and whisk it into the milk and eggs, then stir it in to the flour mixture. Mix to combine and knead the dough until it’s smooth and springy. (Add up to 2/3 cup flour during kneading). Form into a ball, place in an oiled bowl, turn to coat and cover. Leave to rise until doubled (30 min to an hour, depending on the temperature in your kitchen). When the dough has risen to double its size, punch it down, roll out into a rectangle (about 20”x 18”). Roll up (not too tight) from the long side, pinching to seal. Slice into 18 pieces. Place rolls, swirly cut side down, in the prepared pan. It will be snug. Feel free to use a larger pan if you like. Cover and let rise in a warm place until doubled in size, about 30 minutes. Then, bake at 450°F for about 18 minutes. Mix with a fork and add more icing sugar if it’s too runny. Drizzle over the warm buns. Can oil be used instead of butter in this recipe? Hello -- yes, absolutely oil would work, but the flavour would just be a bit different (not as rich). This is a wonderful recipe! I was asked to make a wheat-free bread for Easter Sunday tomorrow. So glad I found this recipe today!!! 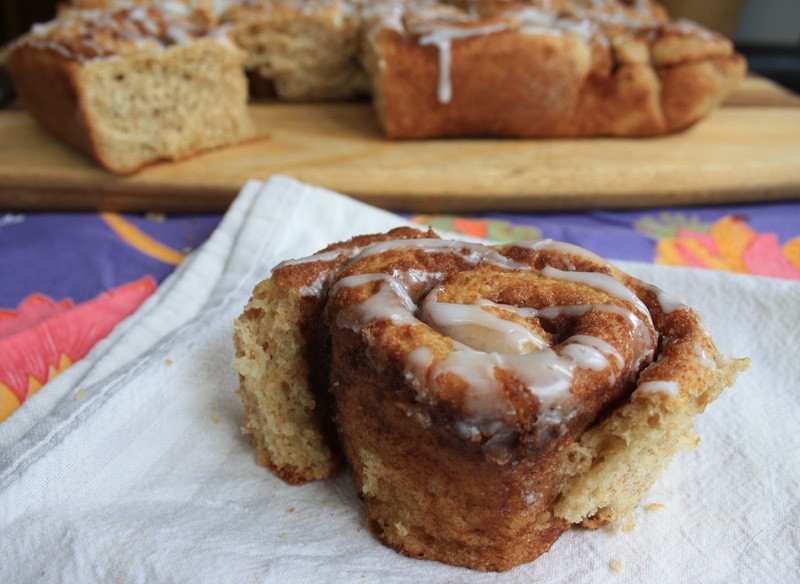 I used white spelt flour (I was worried that whole spelt flour would come out too dense) and I used unsweetened soy milk due to some milk allergies in the family. The bread came out quite fluffy compared to my previous experiences with spelt! The dough was light and airy to work with. I did have to add quite a bit more flour while kneading as 4 1/2 cups barely made the dough come away from the sides of the bowl-- maybe my liquid measure was off a tad, though. I must have added at least another 3/4 cup during kneading. But the final product was great. Wonderful texture-- just like the rolls you get at the bakery!! My husband says they could be more "cinnamon-y" so maybe I'll increase the quantity of the filling next time. Can't wait for my extended family to try these tomorrow! They're going to love them! Thanks for the great addition to my recipe box! Isn't the texture great! 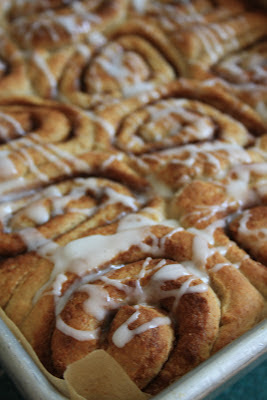 I'm so pleased that you enjoyed them...Reminds me that it's high time I baked them again too.